Transitions between two input clips using an animated lens flare. The clips dissolve into each other, while a lens flare moves along a straight line. The lens flare grows and shrinks over the duration of the effect. The Dissolve Amt parameter should be animated to control the transition speed. The speed of the dissolve between the From and To clips. When set to 1, the dissolve takes place over the entire duration of the effect. 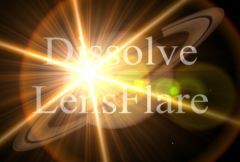 When set higher, the dissolve is shorter, although the lens flare still changes size and brightness over the entire duration. Setting this to 10 can make the transition snappier and more like a flash-frame cut. Hotspot Center: X & Y, Default: [0 0], Range: any. The location through which the brightest spot of the flare passes at the center of the transition. Hotspot Speed: Default: 1, Range: 0 to 2. The speed at which the flare sweeps across the screen. Set this to zero to make the lens flare grow and shrink in place. Hotspot Angle: Default: -25, Range: any. The angle at which the flare sweeps across the screen. Flare Brightness: Default: 8, Range: 0 or greater. The maximum brightness of the flare at the center of the transition. Flare Fade: Default: 1, Range: 0 to 1. The fraction by which the brightness is reduced at the beginning and end of the transition. Flare Width: Default: 2.5, Range: 0 or greater. The maximum width of the flare at the center of the transition. Flare Shrink: Default: 0.5, Range: 0 to 1. The fraction by which the flare width is reduced at the beginning and end of the transition.